Debbie Reese writes about a new children's adventure series in her American Indians in Children's Literature blog (8/11/12). The premise for Scholastic's INFINITY RINGHistory, the kids learn, "has gone disastrously off course" because Christopher Columbus was thrown overboard in a mutiny. Wait, wait, wait... Off course for who?! I guess, in this story, the entire world is a wreck because Columbus did NOT "discover" America. I wonder what this "undiscovered-by-Columbus" America looks like?! Who is making a wreck of what? Who are the "bad guys" Elizabeth refers to?! Scholastic sent out some advanced reader copies (arcs) and by reading reviews at Goodreads, I gleaned a bit more info. Because Columbus didn't "discover America" all sorts of natural disasters are occurring because someone else--"the Amancio brothers"--have done the discovering. I guess they are to blame for the natural disasters. I wonder what the disasters are? Comment: The alternative world without Columbus sounds implausible. What kind of natural disasters could be worse than what we already have: global warming, arctic ice melting, desertification, loss of biodiversity, deforestation, the Indian Ocean earthquake, Hurricane Katrina, etc.? If this world does have worse disasters, how did Columbus's actions 500 years earlier prevent them? Reese doesn't note it, but the Amancio brothers are the crew members who lead the mutiny against Columbus. So we're talking about the same people "discovering" America and returning to the same kingdom to report it. That sounds like Magellan's ship completing the circumnavigation of the world without Magellan. Losing a ship's captain wouldn't change the course of history overall. Or perhaps the mutineers didn't return and America went "undiscovered" for a few years. No matter. The reality is that if Columbus hadn't bumbled into America, someone else would've done it soon. Most likely Indians would've suffered a similar fate no matter who came first. But considering how lucky Cortés's conquest of the Aztecs was, it's possible the outcome would've been better. Any delay would've given the great Indian empires more time to prepare. The outcome is unlikely to have been much worse. How much worse could it get than the extermination of tens of millions of people? 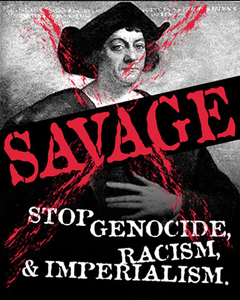 The notion of rescuing Columbus is akin to that of rescuing Hitler or Stalin. It should lead to a serious philosophical discussion. Who decides that the present world is better than the alternative? Why should Indians have to die so that Europeans can live? Since the Europeans profited by conquest, slavery, and genocide, why should anyone give them another chance? I'm guessing A Mutiny in Time avoids all these questions. The no-Columbus world probably experiences floods, hurricanes, volcanoes, and earthquakes for no discernible reason. The author has to invent an over-the-top scenario to justify rescuing Columbus without hesitation. Otherwise, he'd have to address the morality of letting the genocide happen. Heck, if you're going with a ridiculous outcome, why not vampires, zombies, or an alien invasion? Because the Spanish didn't destroy a Maya temple, perhaps a high priest signaled to the "ancient astronauts" to return to Earth. So the lizard people conquered humanity because Columbus died. That's about as likely as natural disasters in 2012 prevented by Columbus in 1492. Not surprisingly, it doesn't say anything about Indians or genocide. It doesn't ask readers to think about whether Columbus was good or evil. Whether the world would've been better without him. Instead it ignores the issues Reese and I have raised. Which undoubtedly means that A Mutiny in Time is part of the pro-Columbus propaganda we've endured so long. The march of (Western) civilization was right and just and godly, we're told, so there's no reason to question it. That the Indians had to die was an unfortunate historical footnote. For more on alternative history, see The Pirate Prince Carlomagno and Tables Turned in Assimilation. "The Discovery of America" by Columbus is as much of a lie as with his mistaken identity/misnomer "Indians". Maybe if they did something like say "the Aztecs were worse", maybe.